I have found my students have a great deal of difficulty with the concept of independent and dependent variables. Newer textbooks will now call these variables “manipulated and responding” but that still doesn’t seem to make it easier for students to identify which is which. No matter how many examples I give them, how many labs, how many graphs, my students will get these questions wrong, particularly on multiple choice tests where there are choices meant to distract the student. 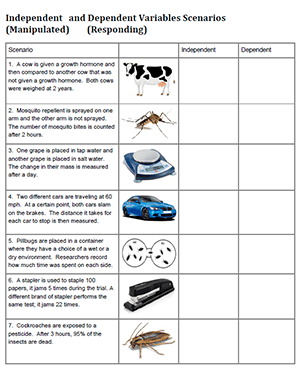 This worksheet was designed as a way to get students to quickly read and identify the variables in a scenario. Each scenario is only a couple sentence long, such as ” One grape is placed in tap water and another grape is placed in salt water. The change in their mass is measured after a day. ” In the chart, students would identify the independent variable as the type of water and the dependent variable as the mass of the grapes. The worksheet is made very simple, to be practice just about those variables and not other aspects of the scientific method. For differentiation, I also have a Bee version (low level) of the worksheet that gives multiple choice options. This version may also be useful for test preparation with other groups.